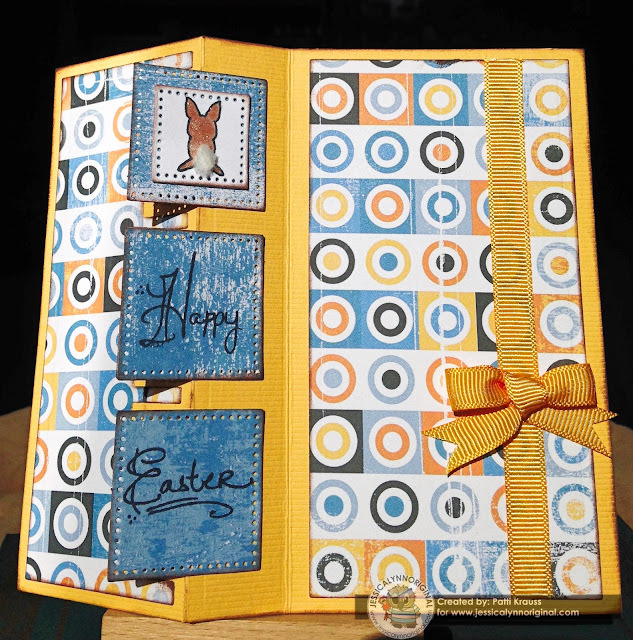 Hi Friends: Thanks for stopping by to see my next project for the pre-release of this really cute stamp set called Happy Easter Banners Bunny from JessicaLynnOriginal stamps. This set is available for pre-order with free shipping until the release date on 3/4/17. Today's card uses another flip card die set that I really love! Flip cards are so much fun to work with & I love that the recipient can have fun with the interaction, too! 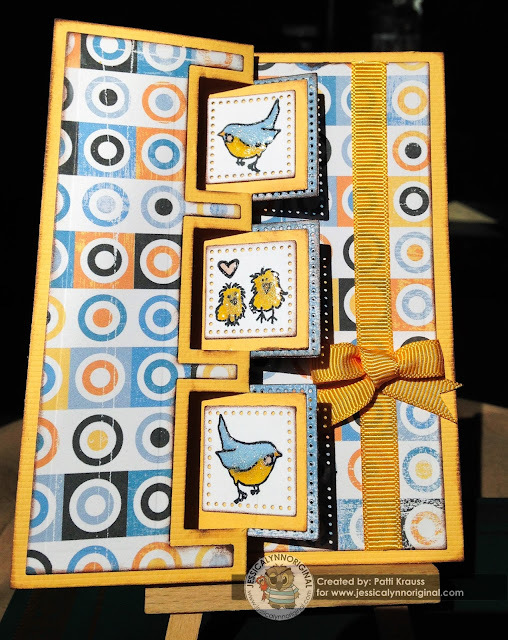 When I saw this stamp set, I knew that it would be perfect for the flip cards that I have - the images are adorable and small enough to fit on the flip sections. I normally stamp and color my images first, but this time I cut the panels, then stamped, so that I could easily see to place the birds and chicks just where I wanted them - it's so easy with clear stamps! Thanks for joining us for the launch of this stamp set! Have a great day! Use the Triple Flip-its die to cut the card base and side panels from the cardstock and patterned papers. Cut 6 of the medium-sized pierced squares from the patterned paper and glue 3 sets back-to-back. Cut 4 of the small pierced squares from smooth white cardstock. Ink all edges. Stamp images onto the small white squares with Memento black ink and color with Spectrum Noir markers. For dimension and interest, add Glossy Accents and ultrafine glitter to the stamped images and let them dry. 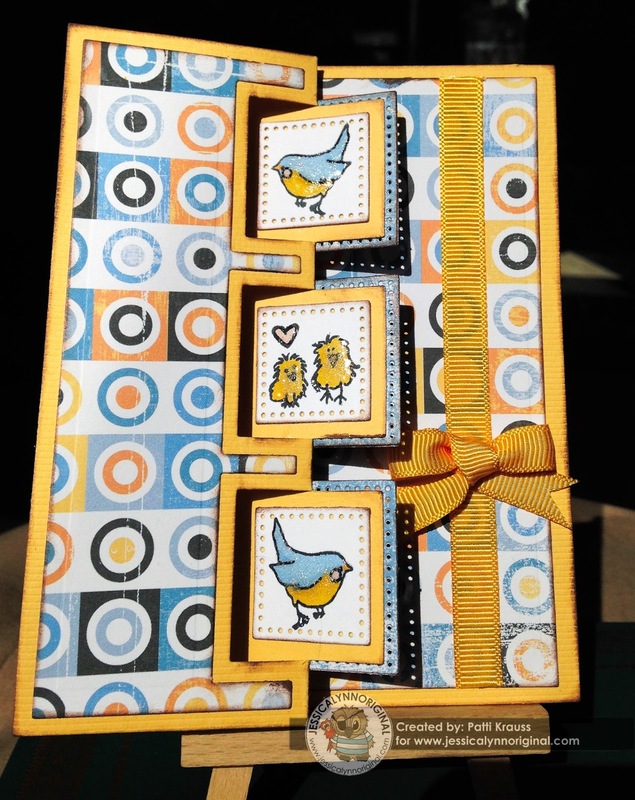 Assemble card and add the bird/chick images to the card front. Add the medium pierced square pieces to the back of the square flips, allowing the pierced edge to peek through to the front of the card. Stamp the sentiment on the back square panels, and add the bunny image to the top panel. Add a little bunny tail using a bit of cotton, then finish with a strip of ribbon and bow on the edge.